The event is an invitational event for the best 16 ladies available, paired up with 16 men of a suitable standard to give each pair an even chance of winning the title and as is always the case, most of the matches were very close battles. One very pleasing aspect of this year’s tournament was the greater number of younger players involved, especially amongst the ladies. This definitely helped to create a very lively atmosphere throughout the event and equally increased the bar takings alongside the event! It really does bode well for a strong ladies game going forward which can only be good for the wider game. From the Friday groups two of those younger lady players to progress through came from the afternoon section as Sophie Dannreuther and her partner Nick Brodie managed to progress with two wins out of two to take their place in the quarter-finals and they were joined by Georgie Willis and her partner Simon Flynn who made it through via the repechage system. On Saturday there was further success for the younger contingent as Tara Lumley and partner Chris Handley made it through along with Clare Bucknell and last year’s winner Ed Popplewell, both pairs progressing with 2 wins out of 2 and no sets dropped to look like very strong contenders for the title. Sadly it was not to be for either pair though as Tara and Chris never quite recaptured their early tournament form as they went down to slightly more seasoned campaigners in Alex Garside and David Fortune 4/6 6/2 6/4. While Clare and Ed lost to Georgie Willis and Simon Flynn 6/2 6/5 in a very tight battle. These two pairs would then meet in the semi-final with Georgie and Simon playing almost faultless tennis to run out convincing 6/1 6/2 winners and take their place in the final. We were also very lucky this year to have two of the up and coming Dutch players taking part in the tournament as both Saskia and Paul Bollerman joined us. Saskia and her partner Robert Dolman were unlucky to miss out on the quarter-final going down 6/2 2/6 6/3 to Lucy Hutchinson and her partner Anthony Jenks but Paul did make it through with his partner Katie Leppard via the repechage and they were to go from strength to strength from there and eventually take their place in the final against Georgie and Simon. 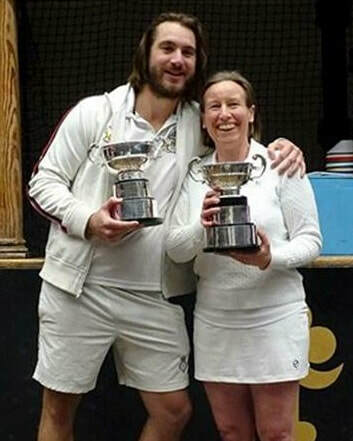 In the quarter-final Katie and Paul were in brutal form overcoming Candida Nicholls and Jonathan Fisher 6/0 6/2 and they continued that form in their semi-final beating Sophie Dannreuther and Nick Brodie 6/3 6/4. Sophie and Nick had come through a fantastic battle with Lucy and Anthony in their quarter-final, winning 3/6 6/2 6/5, with the final set coming down to 5/5 40/40 before they were able to clinch the win. So the final came down Katie Leppard and Paul Bollerman against Georgie Willis and Simon Flynn and it was the very definition of a game of 2 halves. Georgie and Simon were absolutely awesome, taking the first set 6/1 and maintaining the momentum in the second set to lead 5/1 and up to that point they had barely made a mistake between them. Katie and Paul hadn’t really done anything wrong, they just didn’t get a look in, as relentless retrieving and brutal hitting from their opponents made it look like it was going to be a very quick final. Slowly but surely Katie and Paul managed to gain a little foothold though and the turning point of the match was clearly at 40/40 when Georgie and Simon had what would be their only match point and were defending chase worse than 2. They played 2 balls which in hindsight could probably have been left, although it would have been close and the third shot Paul steamed a ball into the dedans to win the point and the game and from there the tide well and truly turned. From 6/1 5/1 down they didn’t drop another game, winning that set 6/5 and having started at 3/3, they took the deciding set 6/3 for an amazing win and a fitting end to a fantastic tournament. Huge congratulations to all 4 players who all played their part in a brilliant spectacle of a final! Huge thanks as always to Viv Dawes for her excellent organisation and pairing up of the teams. Thanks also to Hatfield for hosting the event, Liz Fisher and her excellent team who took care of the catering and the Hatfield Pros for all their efforts with the marking. Many thanks to Simon Flynn for the photographs.